The below map highlights the places that gave back the most in 2016. The study takes into account charitable contributions as a percentage of net income, and the percentage of taxpayers that gave any amount back in any given county. Scroll below to view the data and methodology for how the data was researched and compiled. 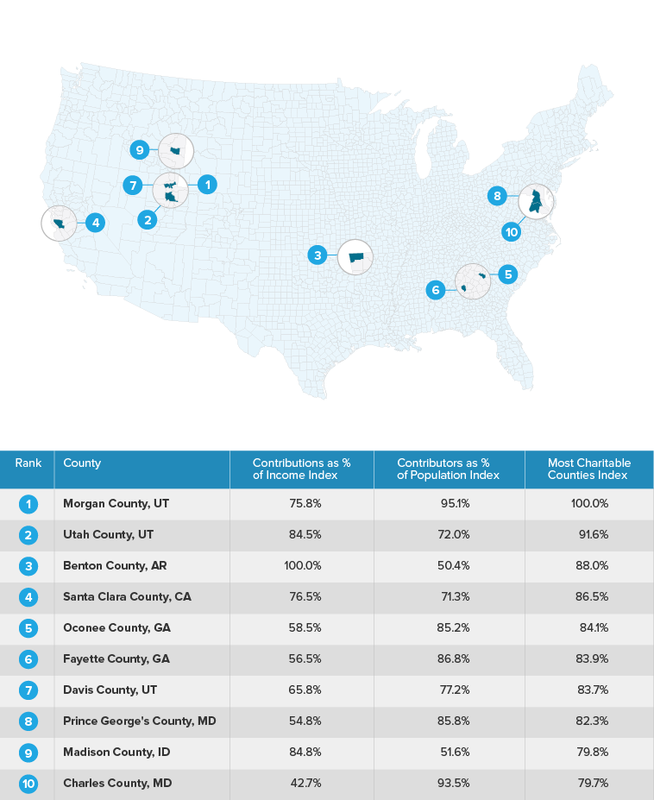 Which counties have the most generous residents? To answer this question, we looked at two factors: how much people donate as a percentage of their net income, and the proportion of people in a given county who made charitable donations. To determine the amount that people donate as a percentage of their income, we first had to calculate people's net income. To do this, we looked at tax return data and subtracted total taxes paid, mortgage interest, mortgage points and mortgage insurance payments from total income to get each county's net income. We then divided each county's total charitable donations by its total net income to see how much county residents are donating relative to their income. Next, we took the total number of tax returns with charitable donations and divided them by the number of total tax returns for each county to get the proportion of people in each county who make charitable donations. We then indexed and equally weighted the two factors to yield our most charitable counties score.